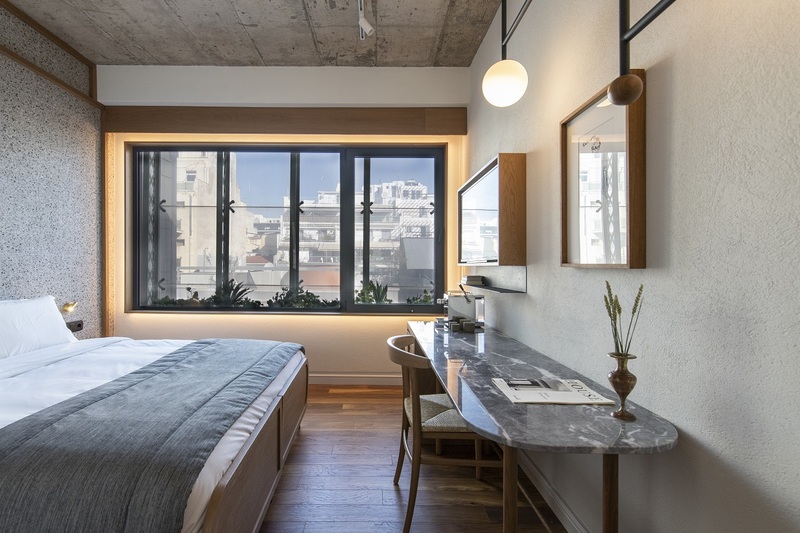 Ergon House sits on Mitropoleos street, in the heart of Athens, on the ground floor of a 4-storey building that has a listed two storey façade and four storeys of new-built addition in the 90’s. 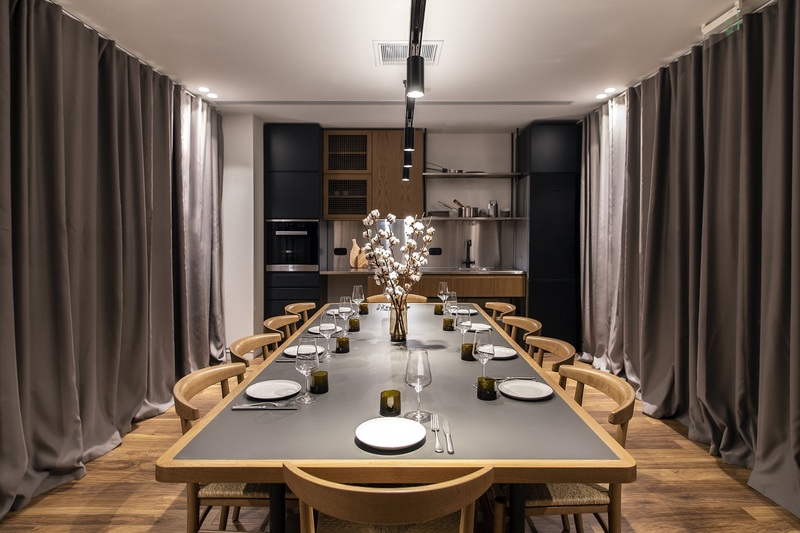 In total, the Ergon house is a one-stop shop where gastronomy and hospitality meet. 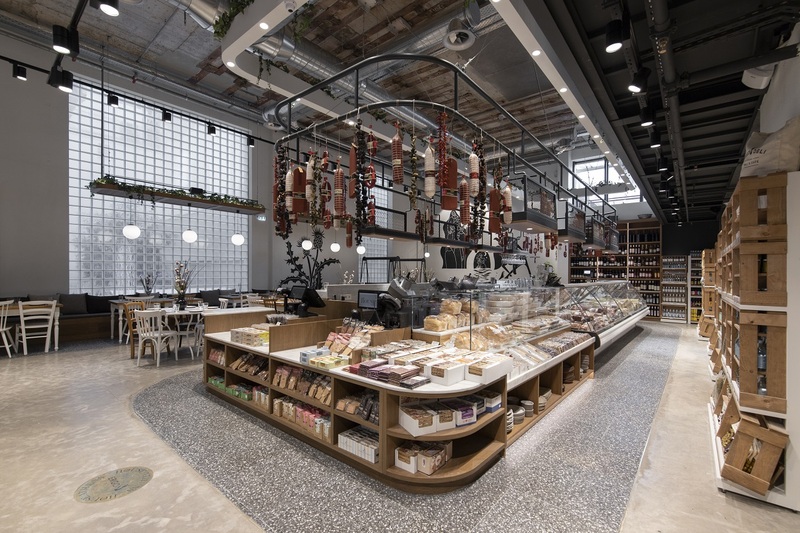 Restaurant and deli store facilities are taking place on the ground floor that expands partially in the atrium that is formed between old and new facade and partially on the rest of the double height core floor. 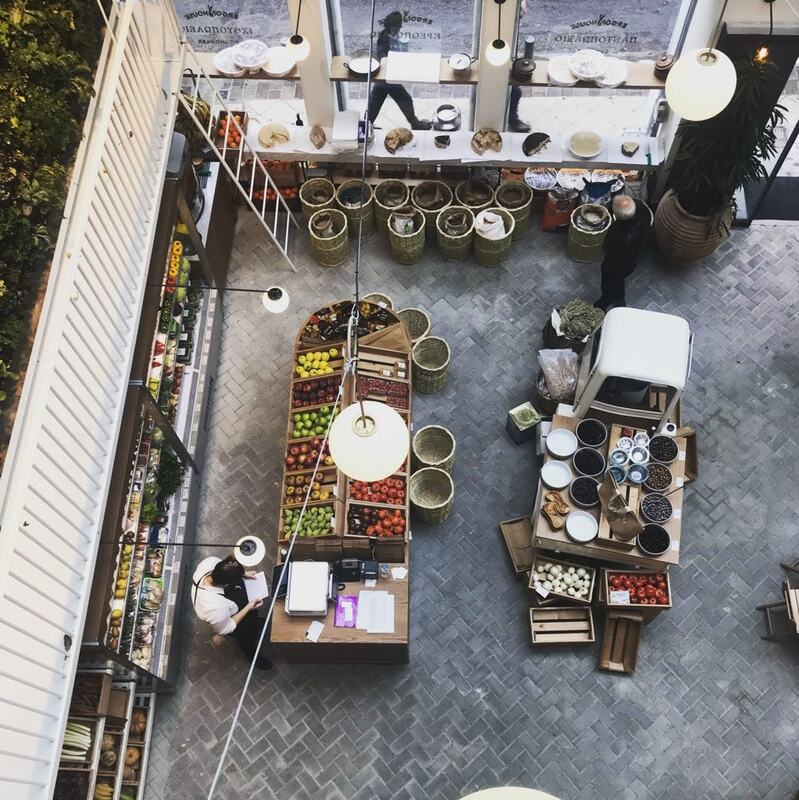 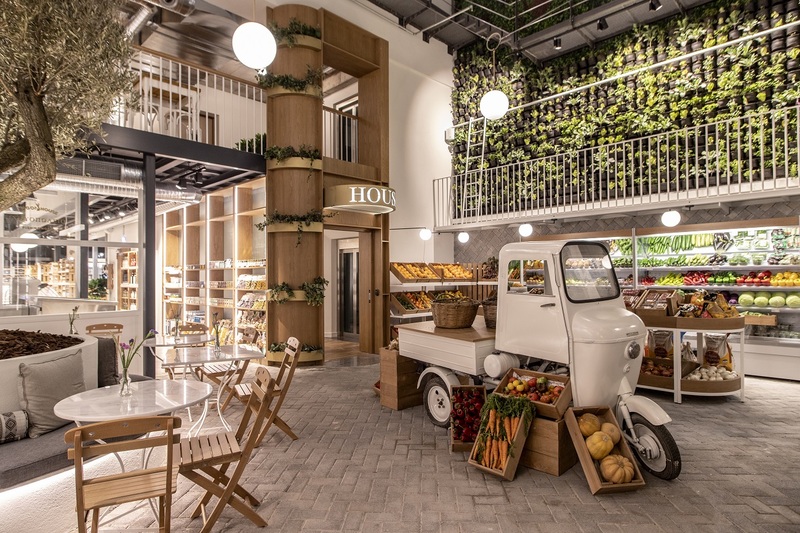 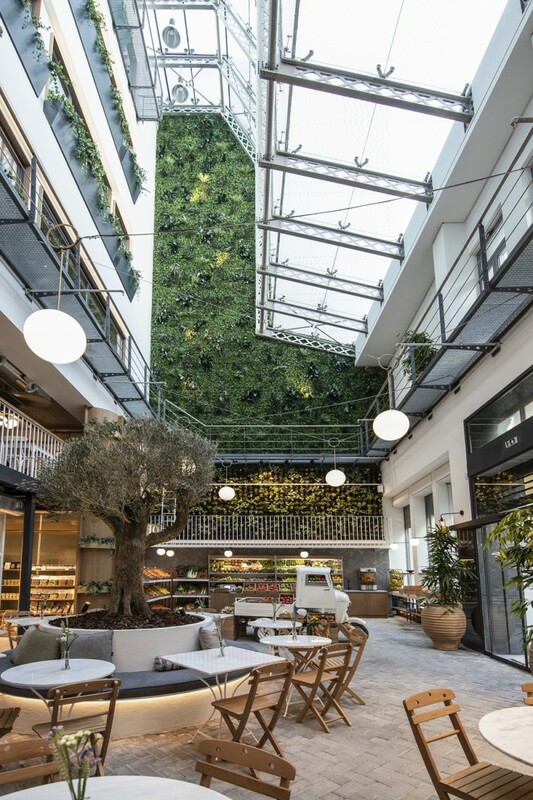 The atrium’ s floor is the interior courtyard that houses the fresh groceries, the café, the open oven and the olive tree in the middle, around which all are arrayed. 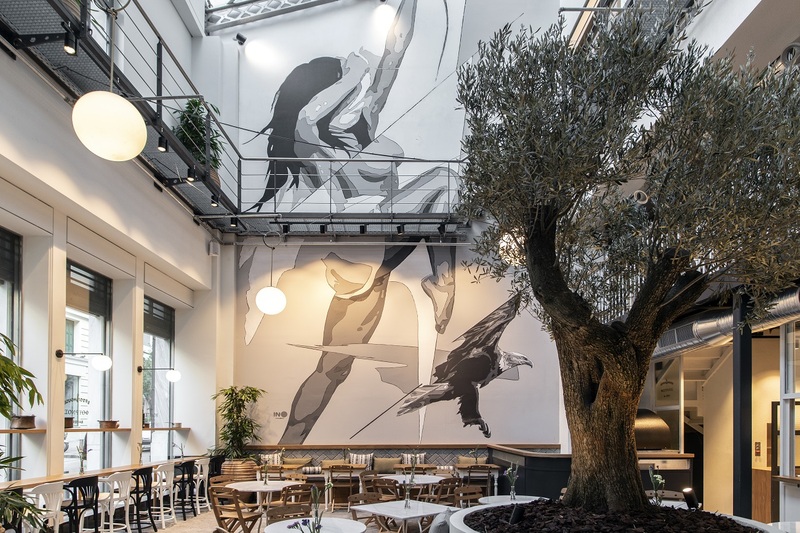 The avli is paved with concrete blocks, whereas on one the side we find a vertical garden, and on the other a street graffiti by INO. 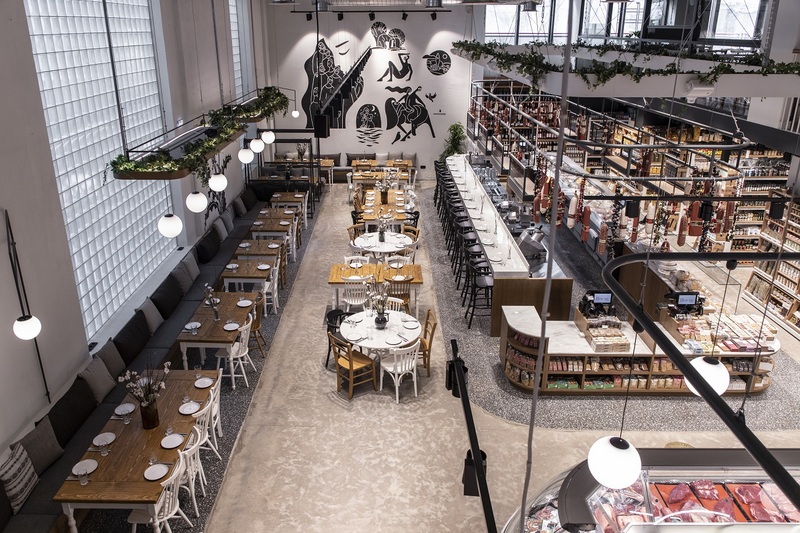 Entering the second part, the double height creates a magnificent feeling of warmth, with the central unit of the bar, the grocer’s, the fishmonger and the butchery right in the middle. 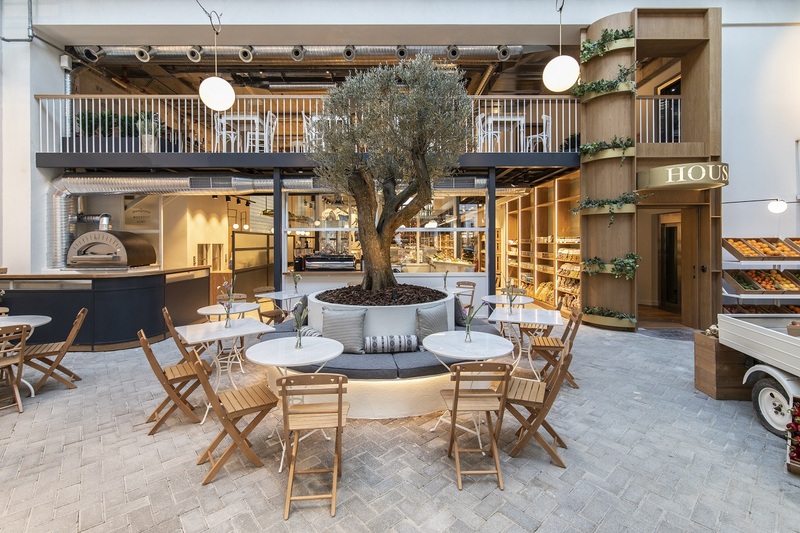 Around that, multiple seating areas are found, with marble, wood and fabrics giving the traditional colors of a Greek village piazza. 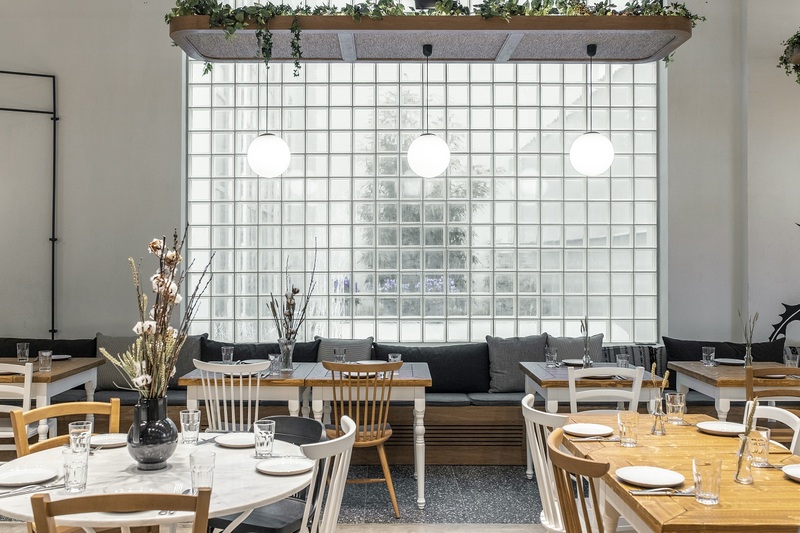 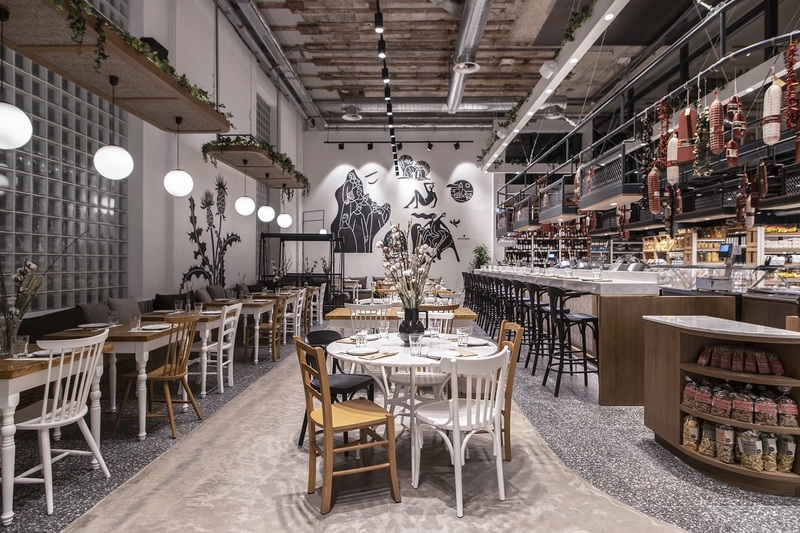 “The concept of the contemporary Greek city and its materiality during the last few decades become alive by using walnut timber, black terrazzo and marble from Kozani”. 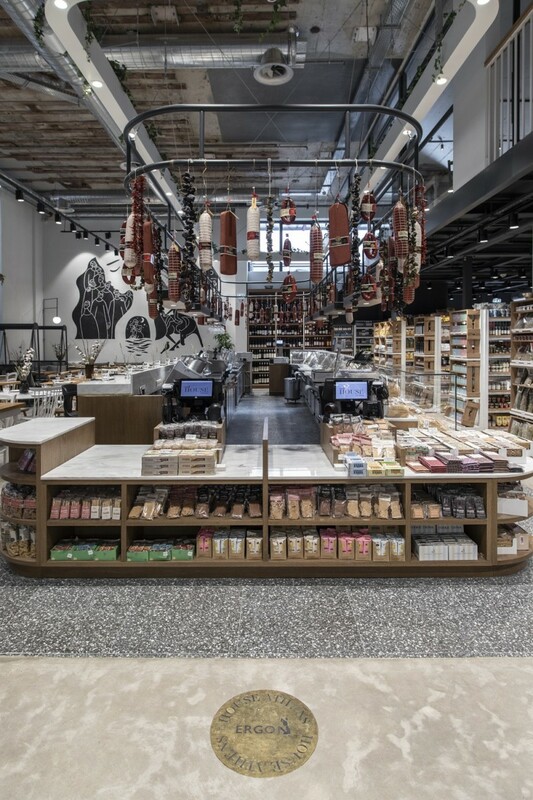 The materiality of the Greek city is present in the finishes, as walnut, terrazzo, concrete blocks and floors are found within the interior of the store. 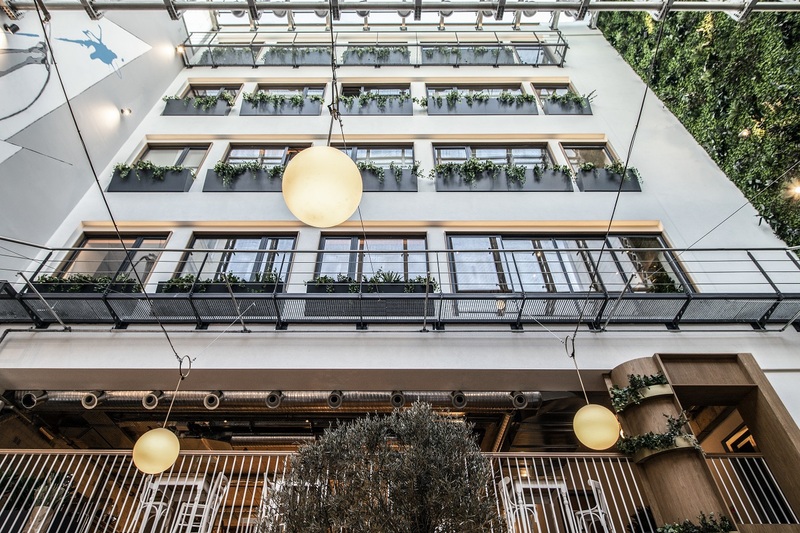 The entrance of the hotel is revealed after one has crossed the atrium. 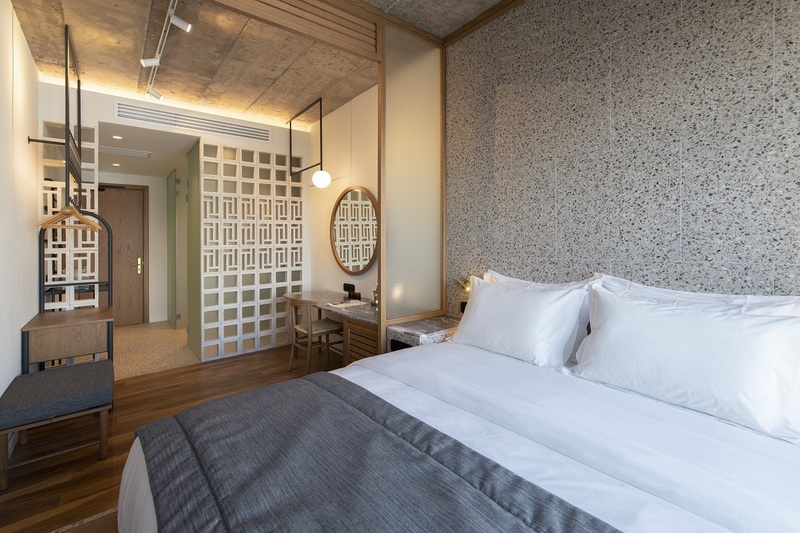 The rooms have an interior facade looking at the atrium and a back looking at the Acropolis. 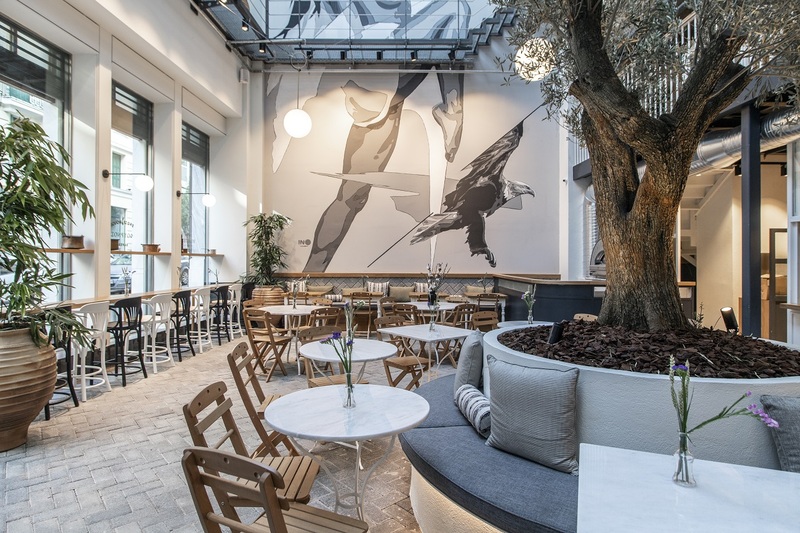 “This hotel’s biggest challenge was to combine traditional Greek architecture along with needs of the modern gastronomy-oriented traveller”. 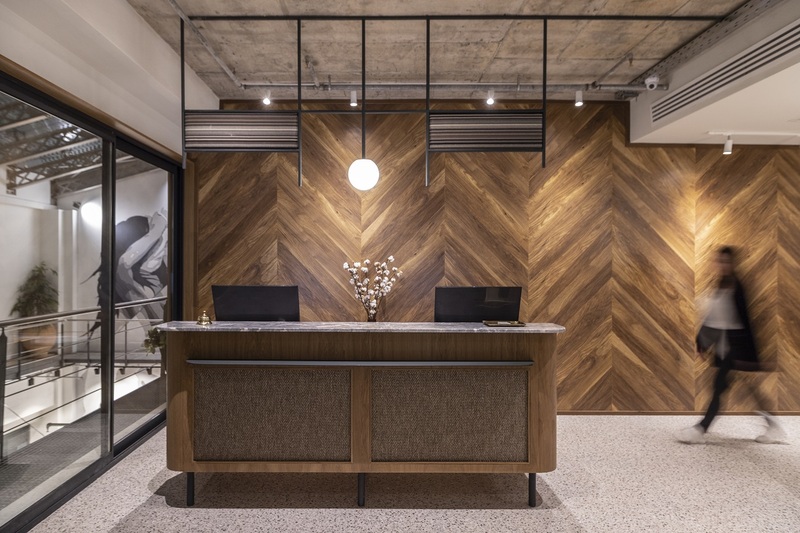 Working with a rectangular shape of the typical floor, the rooms are arrayed around central common spaces such as the lobby, the shared kitchens and the fitness room. 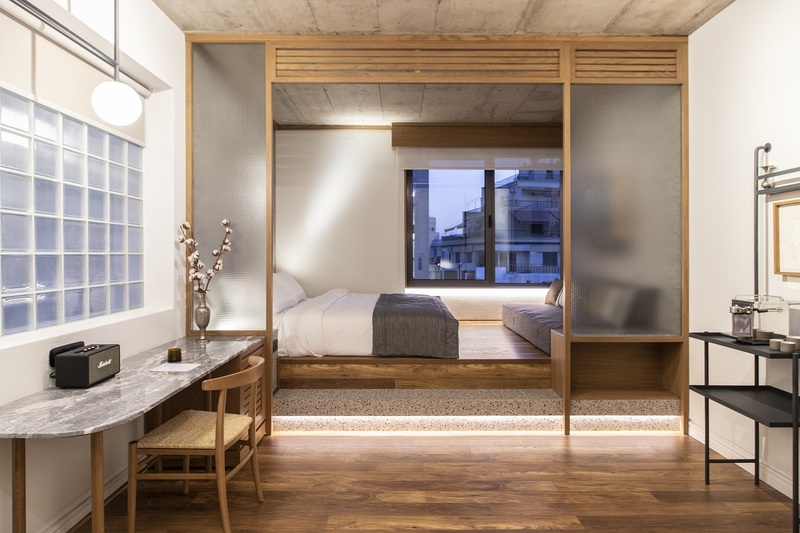 In a rectangular room, the bed is placed towards the one end of the room next to the window view. 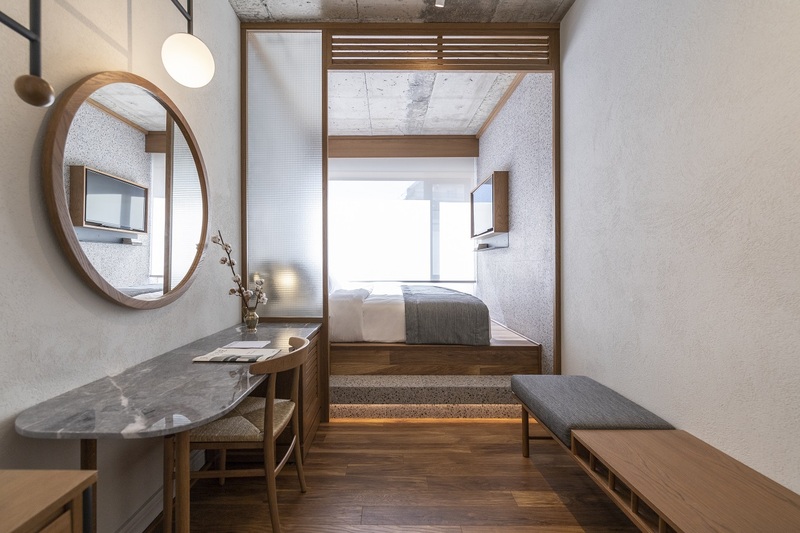 “The room is arranged in three zones; the entrance through the wet areas, the sitting area with the desk and a bench and an elevated large open sleep area”. 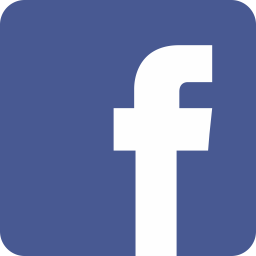 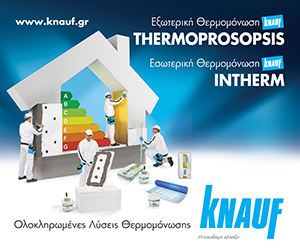 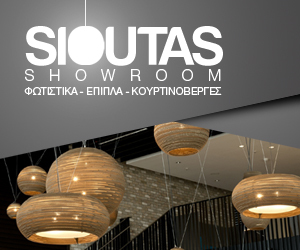 The reception is located on the first floor along with the lounge area with a wide view to the 25 meters atrium with the courtyard and the entrance in Mitropoleos street on the ground floor. 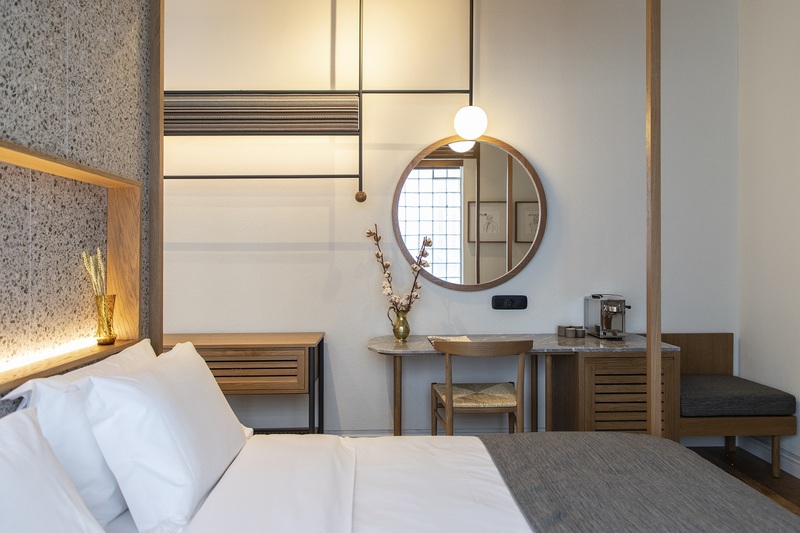 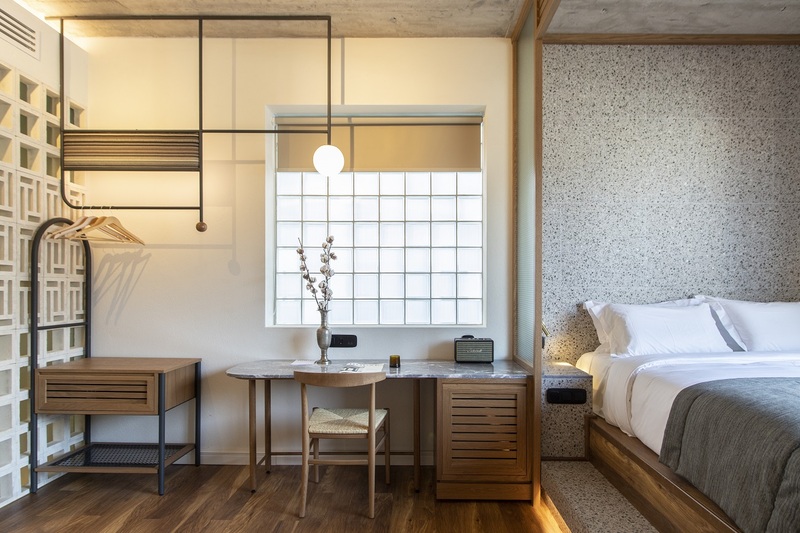 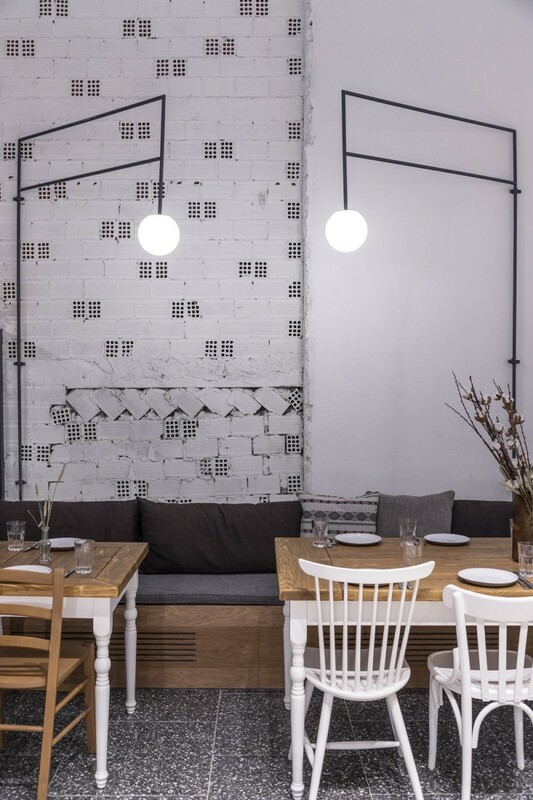 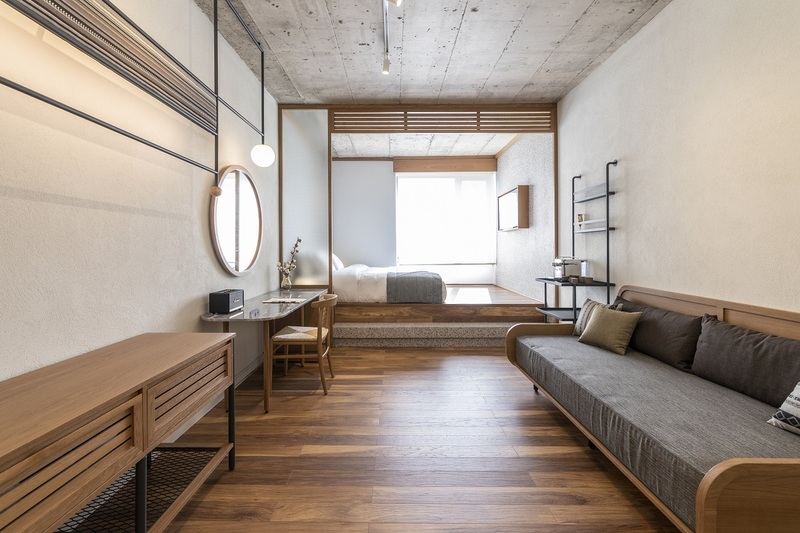 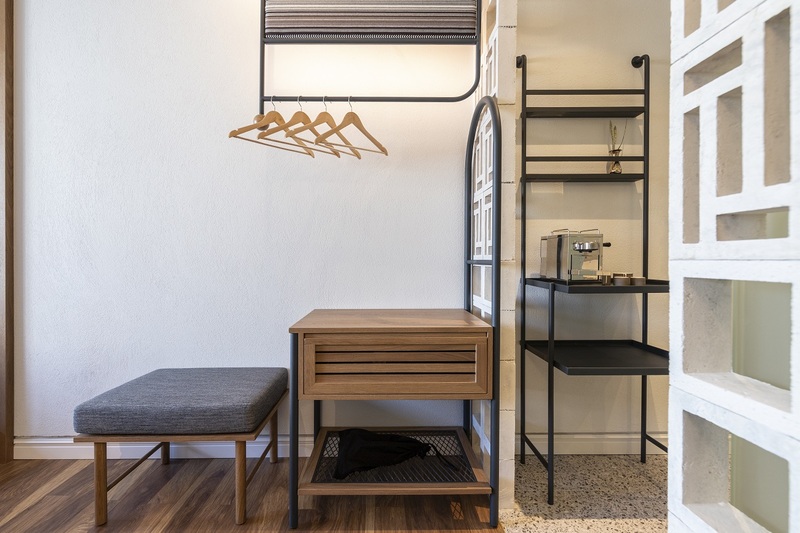 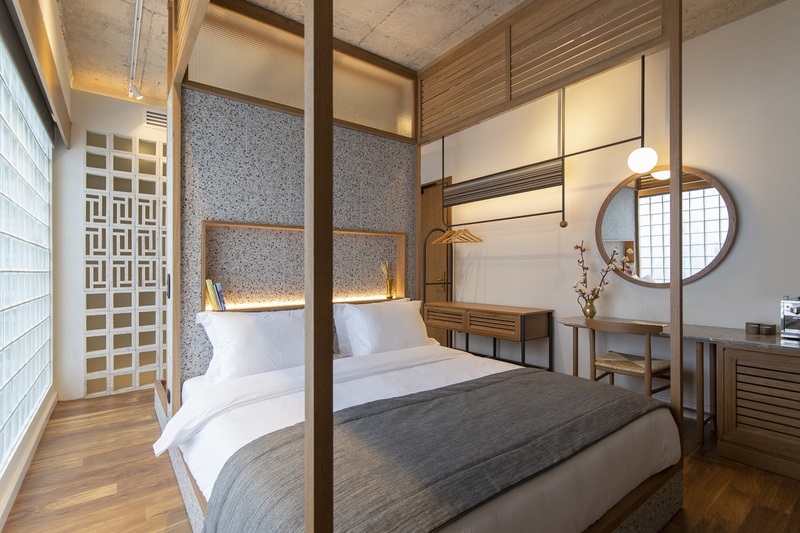 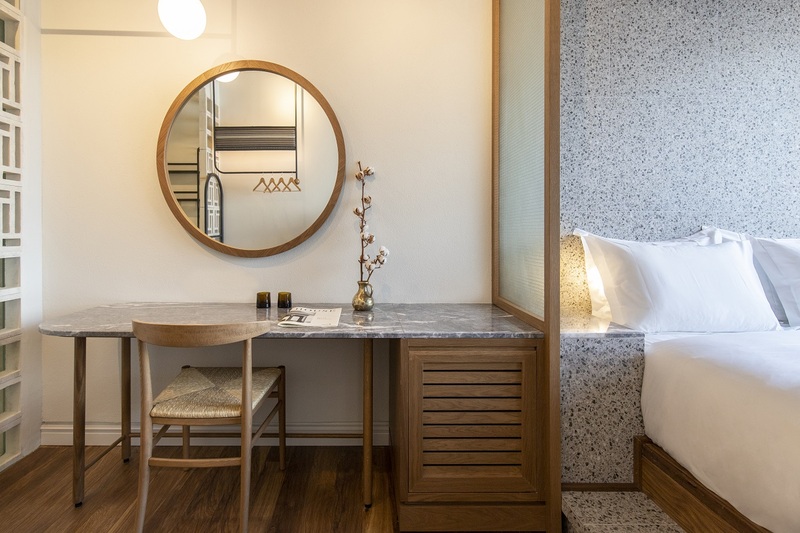 The interior design spins around traditional Greek architecture; the beds echo the old bunk bed style, while the decorative cinder blocks refer to the entrances and lobbies of downtown Athens multi-storey buildings of the 60’s. 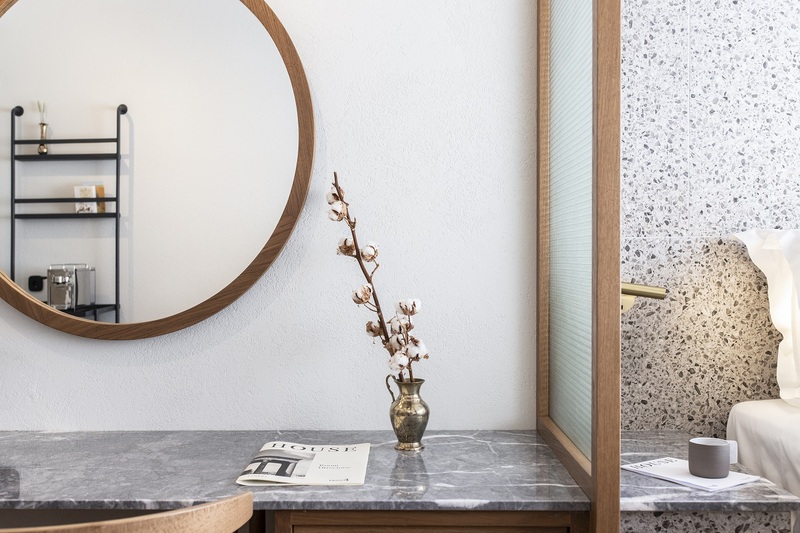 Old marble steps were hewed and transformed to basins. 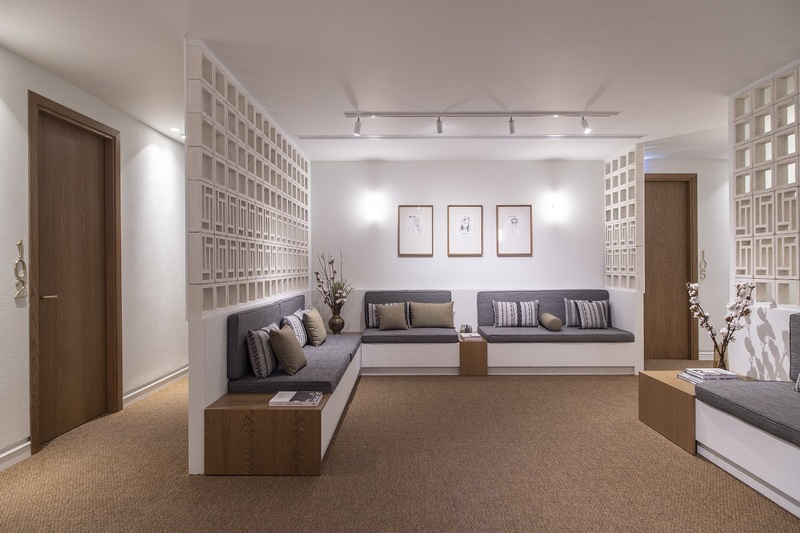 “In the tapestry above the sink and the wardrobes, woven loom textiles are used as a decorative element”. 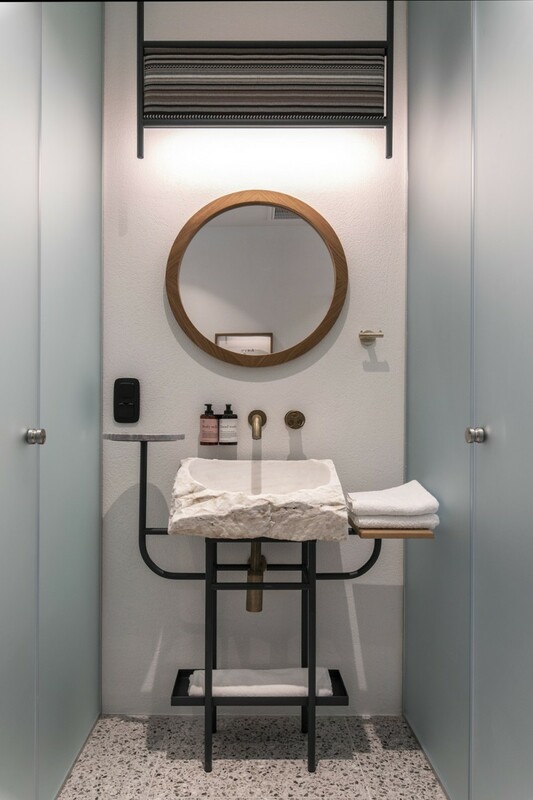 The contrast of colour in each space is achieved by using off-white paint on the walls, as found traditionally in whitewashed buildings, and timber elements made of walnut, a tree found all around the country, while natural brass details add a sense of old-fashioned luxury in the rooms. 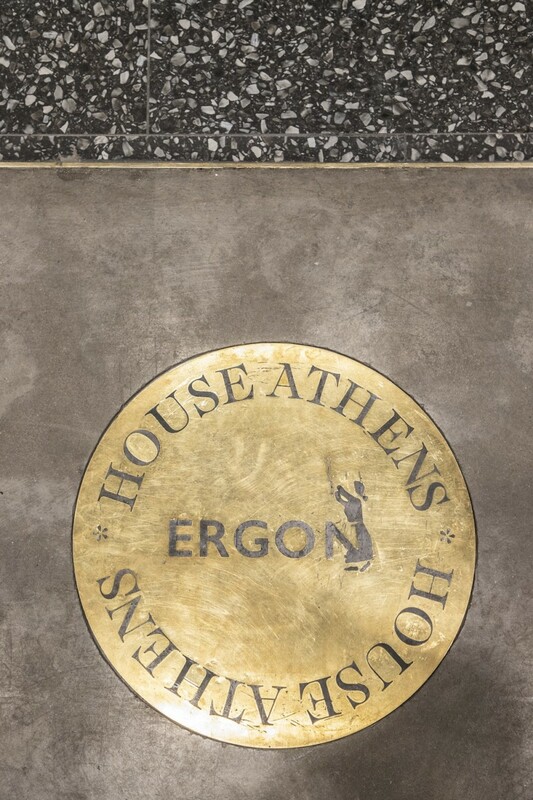 The terrazzo, a durable material used since 1930, is now making a comeback in Greek architecture due to its timelessness and can be found both on horizontal and vertical surfaces in Ergon House.